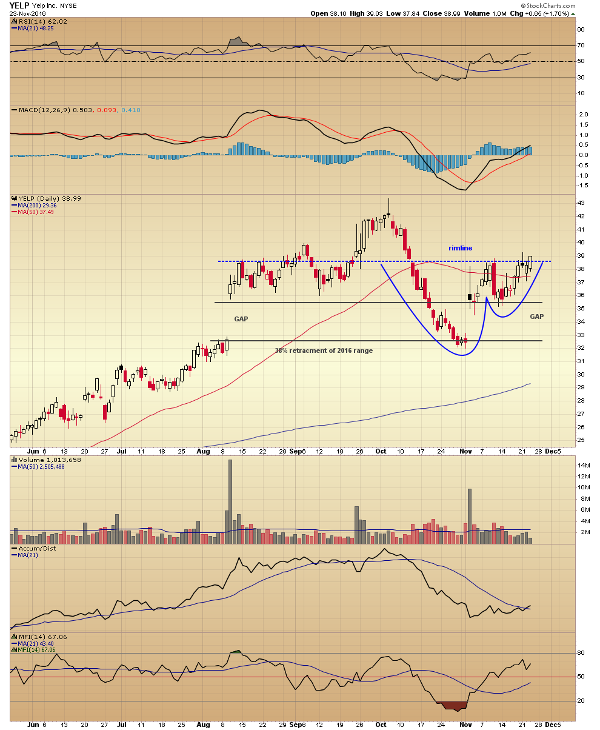 Yelp stock is targeting new highs with a bullish technical pattern known as a cup and handle. A well-defined technical continuation pattern has formed on the Yelp (YELP - Get Report) chart, and the stock price is currently testing pattern resistance. A break above this level projects a measured price objective of $44.50, or a nearly 19% move above its current level. The stock gapped higher in August, and then moved in a sideways channel before making a high for the year in early October. It immediately reversed course and by late October had retraced 38% of its 2016 range and closed the gap. That low was followed by another gap higher of relatively the same height as the August gap, forming the cup portion of a cup and handle pattern, with the handle forming this month below the rim line in the $38.50 area. The stock closed near its high on Wednesday, just above pattern resistance, and looks like it has finished consolidating its earlier gains and is prepared to return to its longer-term uptrend. Moving average convergence/divergence made a bullish crossover this month, as the relative strength index crossed above its 21-period average, and both indicators recently tracked above their center lines. The accumulation/distribution line crossed over its signal average, and the money flow index, a volume-weighted relative strength measure, has moved above its center line. Money flow is supporting the positive shift in price momentum. Yelp is a long candidate at its current level, using a trailing percentage stop. The cup and handle formation projects a pattern price objective measured by taking the depth of the cup and adding it to the rim line, and it targets the $44.50 area, which would be a new 52-week high. This article is commentary by an independent contributor. At the time of publication, the author was long YELP.